When enable “DirectWrite”, it will use “Auto-Detect” by default. And then open some files, it might have an unexpected black line in the bottom. I know this is a bug under a certain circumstance, but I couldn’t reproduce the issue. If you find the condition where you can reproduce the issue, can you please write more details? Or can you export current settings (including AppData folder) exported from Tools menu > Import and Export > Export all settings into a registry file, and send the file to tech @ emurasoft.com? If this is a portable version, you can send all INI files with the AppData folder. Thank you. Suppose it is related to EE launch method. Test conditions: Win7 64bit; EmEditor v17.5.902 64bit or 32bit portable, all default setting. Initial launch EmEditor, enable “DirectWrite”, and then close EmEditor. 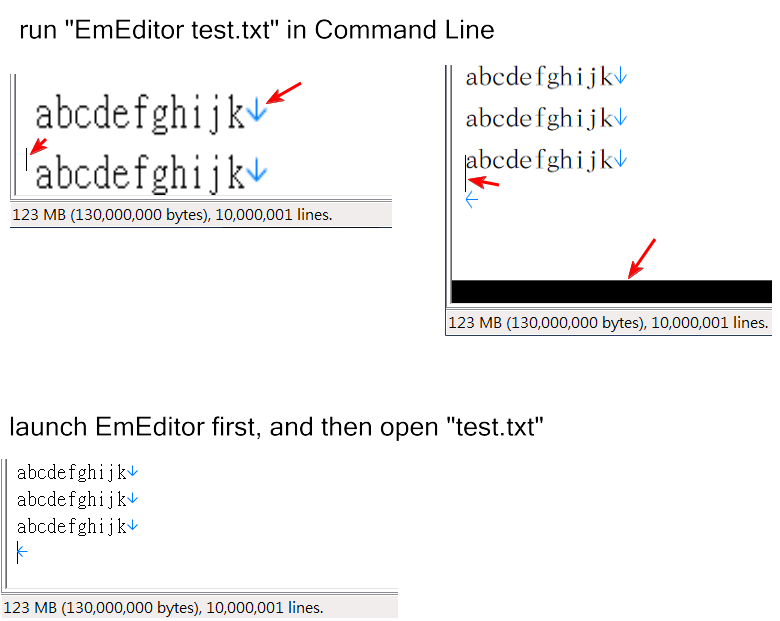 If run “EmEditor test.txt” in Command Line, the text sizes and cursor position was wrongly displayed. Sometimes, it will also show the Unexpected black line in the bottom. If launch EmEditor first, it will create Untitled-1, and then open “test.txt”, the text sizes and cursor position are displayed correctly. What was the name of the font and size when you open “test.txt” file in EmEditor (See the View menu)? What is the file encoding of the file (UTF-16 or UTF-8 or something else)? Also tested on Win10 64bit with many different fonts, and encoding of the file is UTF-8. All of these fonts have the same problem. I still can’t reproduce the issue. Do you use dual monitors (or more than one monitor) ? What is the DPI (or scale) for each monitor? Which language version is your Windows, English, or Chinese? Which language is specified in the Current Language for non-Unicode programs in the Administrative tab of Region settings in Control Panel?